Known as Organic Best Ale in the UK. Poured a nice dark brown with a very small white head. Aroma was instantly of british hoppiness, with some maltiness in the background. Taste is nice & bitter up front, then finishes with a beautiful butterscotch taste. Nice carbonation and very clean mouthfeel too to make this one drinkable beer. Went great with some traditional style cheese fondue - I could have drank all night, but I was too stuffed after such a great meal!! I'm not sure why this beer didn't score in the 90's here on BA. Not to call into question the impeccable palates and discriminating taste of these 'experts' but I sometimes wonder what they actually expect from a beer. 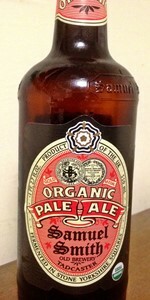 Sam Smith's Organic Pale Ale is a world classic, in my view, a definitive example of the variety. It's a traditional, regional English country ale, not intended to hit you over the head with any one of the characteristics of beer (look, smell, etc.) although I do find the rich copper hue quite pleasing to the eye... Smell? Nothing to write home about, but the taste? It's got a solid malty backbone with a slight hint of mustiness that I suspect might come from the stone troughs used in fermentation. Hops are not forward, but they're not supposed to be. There is hardly any hop character, but it still packs enough tang to satisfy the hop-seeker. ... The "Organic" variety, in fact, has permanently replaced the original "Old Brewery Pale Ale"; folks just found this one to taste better so Sam Smith's ceased production of the other one... Is this one for the growing numbers of hop-crazy beer enthusiasts? No. Is it for the Yuengling-Bud crowd? No. Is it for the drinker who appreciates tradition, quality and craft? Yes. Hazy, copper colored body with a decent off-white head. While my last Samuel Smith's beer (their Pure Brewed Organic Lager) was disappointing, I am a fan of this brewery and this pale ale fosters that view. The malt/hop ratio is high for style, leaving some toffee and bread flavors most obvious. There are adequate hops to add complexity and to make this mildly bitter overall. Overall: a "pale ale" leaning towards an ESB or brown ale. Poured from the 550 ml bottle into a shaker pint glass. In addition to the typically cool old timey label with Yorkshire rose is a "USDA Organic" sticker. I got a mild gusher upon opening. An easy pour produces about a one inch head that proves fairly sticky. The beer is a slightly hazy ruddy pale brown with rather high carbonation. Subtle floral and tea-like hop aroma-flavors with a rich caramelly malt base. A nice fruity pungency evocative of apricot underlies everything and contributes to an illusion of sweetness belied by the dry mineral finish. Another excellent and accessible beer from Sam Smith (more and more available in my area). I continue to be intrigued by the whole Yorkshire square method of brewing, and how this obviously contributes to the unique qualities manifested in the beer. This beer was very reasonably priced at 4-something for the bomber. Purchased at Front Street Market in Butte, Montana. For a pale, it's pretty dark, but it's a really nice reddish-yellow colour with a big, foamy head. Smell: Faint, but some hops and fruit. Taste: Very hoppy. Quite bitter. Surprisingly thick mouthfeel. I could drink a lot of this, which is good since the bottle is big. Poured this beer into a bottle. Poured with a decent amount of head. The beer looked very good with a murky light amber look to it. It smelled sweet with a fruit smell and a light hint of bananas. I was very disappointed when it came time to taste the beer. It has a lot weaker of a taste then I was expecting and wanting. I did not rate the beer down too much for this, because I would have been rating the beer on my expectations and not the quality of the beer. The after taste is pretty smooth with a interesting after taste that I cannot place. Final thoughts, I think the beer would be good during the summer while relaxing in a chair outside. Maybe too descriptive on that one. Cheers. the smell is of faint hops and something a little sweeter that reminds me of peanut brittle, but i dont think thats it. Pours a hazy but clear light orange with a one finger head. Aroma is yeast, cereal graininess, caramel, and lemon. Smells good but nothing special. The taste is fresh baked bread and caramel. I get some lemon coming through as well. Mouthfeel is light with good carbonation. Overall, a very sessionable EPA. It has a lot of good flavors going on, but the yeast character is a little too strong for my preference. Definitely glad I picked this up. pours a reddish copper colour with a thin white head. Fruity aroma with a little malt. Medium carbonation. Flavours of apple, melon, a little caramel, sweet and light bodied. Presentation: 550 ml clear bottle, gold foil around the neck and cap. No date information. I think this has been sitting around a while, but its been in my fridge for most of that time (if there was a date I would know for sure!). Appearance: Reddish brown in color, clear with a good sized head that fades to average lacing. Smell: Caramel malt, just a hint of butterscotch (diacetyl?). Taste: Smooth mouthfeel, great carbonation level (low, but still there). Nice caramel malts, just a bit of sweetness without being too much. Overall impression: Nicely balanced and highly drinkable. Light amber colored. Not that much head, although it may have been an uneven pour. Plenty of carbonation. Smells of hops and honey. Interesting taste. Honey, butter, hops and a touch of coffee. Never had a beer quite like this, so I give it points for originality. Presentation: Great big 550ml custom brown Victorian pint bottle (a real pint), with old-style labeling. No freshness stamp. Organically Certified brew. Appearance: Pours a mean head with a wild carbonation rush that creates a magnificent foamy white head. Beer is a bright, clear gold. Smell: Nose of dried fruit, grain and perfumy fresh floral aromas. Like smelling a delicate flower. Taste: Body is full, but not heavy. Mouthfeel is even and smooth. It's a rather malty brew, but not in the sense of powerful sweetness, but rather presence. The sweetness is there (a touch fruity, like unsweetened mixed dried fruit with an underlying dextrin), however it is well-rounded and balanced to perfection. Hops come in with a slight, building tingle on the palate then slide away leaving a raw hop leaf and semi-herbal/floral taste. The end dries up, just a bit, with fresh grain flavours and a faint coarse hop astringency. Light metallic finish. Notes: Hmm ... how pleasing, and similar to their organic lager in many ways(?) ... but who cares. Just think of an ale, one for any occassion, never too strong, never too weak and never overpowering in any of its characteristics. A perfect balance of organic ingredients. If you have that picture in your head, it's this ale. Thanks to Merchant Du Vin for the fresh sample. A nice copper colour with a good off-white head. Smells vaguely like Samuel Smith's Nut Brown Ale but a bit more burnt and hoppy. Taste is similar; again, a bit more hoppy and burnt, slight tinge of copper. Not terrible, but not the best. A bit fizzy on the tongue, but still smooth drinking.